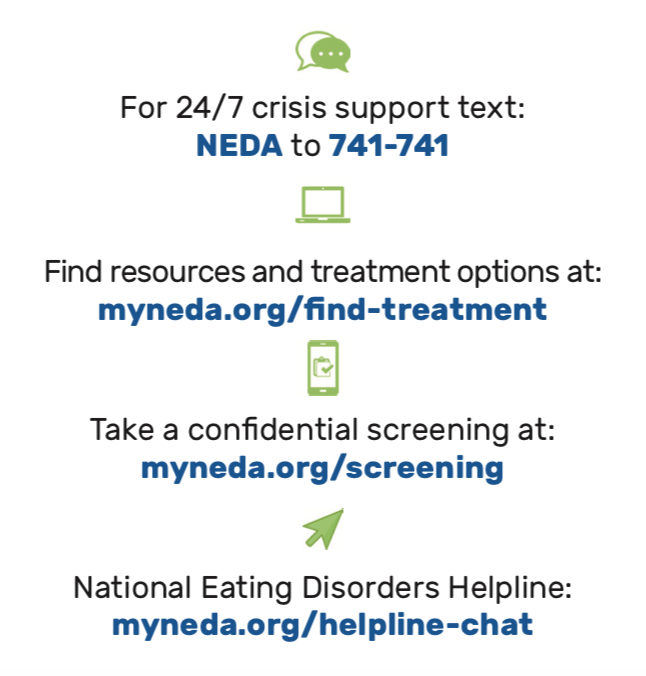 Today starts National Eating Disorders Awareness Week, 2019. Eating disorders are such complex illnesses that involve a multitude of factors. The side effects and conditions that often come with these disorders range from anxiety to depression to malnutrition to amenorrhea to negative body image and low self-esteem to suicidal thoughts… and that list is just getting started. Today I want to talk about some of the effects that an individual may experience due to the lack of nourishment that comes from an eating disorder. Not only does malnutrition cause physical effects and changes, but the brain is also being deprived, causing numerous mental and emotional responses as well. This list is not all encompassing, but I hope it begins to give you a sense of the severity eating disorders involve. Eating disorders and malnourishment have a profound effect on cognitive function. The ability to concentrate, focus, and process information dramatically declines as health deteriorates. Individuals are often irritable, apathetic, and very disengaged from life. All of their thoughts are focused around food, eating, how not to eat, exercising, and weight, and this doesn’t leave room for normal thinking. The body and brain need food to survive, so thinking about and seeking it at times is a means of survival. 2. Hair, skin, and nails. Without proper nutrients and hydration, the body is not getting enough vitamins and minerals to transport to all of our different tissues. Hair starts to fall out and lose its shine, nails become brittle, and skin becomes dry and cracked. The body is using any nutrition that it does have to try and keep vital organs working, leaving these other bodily processes incomplete. Very fine, light hair, called lanugo, begins to grow all over the body as a means of insulation because fat stores are being depleted. A lack of nutrition has an effect on all of our organs—heart, liver, kidneys, pancreas, intestines, etc. As the body slows its processes in an attempt to conserve energy, heart rate decreases, blood pressure decreases, and irregular heart rhythms may occur. Nausea, dizziness, and fainting are common. The body has a difficult time staying warm, resulting in the lanugo I mentioned earlier. Dehydration can be especially damaging to our kidneys, and after too much strain on any organ, it will lead to failure. 4. Decreased white blood cell count. Without sufficient energy intake, the body cannot sustain normal bone marrow function. A low white blood cell count makes an individual more susceptible to disease and infection, and a malnourished body will have a difficult time fighting that off. Red blood cells are also affected, often leading to anemia. 5. Osteoporosis, stunted growth and/or development, and other conditions. Insufficient nutrient intake and/or absorption will lead to deficiencies and subsequent conditions. Bones become hollow and brittle when calcium and vitamin D levels are low. The body will actually begin to breakdown muscles and organs to use as energy when there is no supply coming in. In a teen or individual that is still growing, their growth can be very stunted or delayed, temporarily or permanently. 6. Hypothalamic amenorrhea and infertility. Females often stop menstruating when the body is becoming malnourished and under a significant amount of stress. Estrogen levels drop, which can lead to night sweats, loss of sleep, irritability, and increased depletion of calcium from bones. This hormonal imbalance can have lasting consequences. 7. Suffering relationships and social life. Eating disorders don’t only affect the individual suffering, but those around them as well. Relationships suffer as a person becomes withdrawn and uninterested. Eating disorders want to be alone and isolated, so individuals avoid social affairs and experiences. A serious lack of energy also contributes to extreme fatigue and lethargy. Ultimately, eating disorders can and will lead to death if left untreated. Somebody dies every 62 minutes as a direct result of an eating disorder, and anorexia nervosa has the highest mortality rate of any mental illness. (1) Too many people are left suffering and without treatment, and too many precious lives are taken by these fatal diseases. All of these effects are real, possible, and, unfortunately, common. The good news, however, is that many of them can be reversed or improved with proper treatment and restoration. Brain fog can go away, hair can grow and be shiny again, growth and development can resume, menstruation can return and a woman can conceive, and relationships can be healed and restored. An individual does not have to be “underweight” or look malnourished to be suffering the consequences. Eating disorders do not discriminate; they affect men and women of all shapes, sizes, ethnicities, ages, and backgrounds. Help is available. You are worthy of getting the help you need. Please reach out if you are struggling. Send me a message or use one of the support resources below. Here’s a screening tool to help determine if professional help may be needed. If you’re fighting, stay strong. If it’s a loved one, support them. There are resources from the National Eating Disorders Association on how to navigate this slippery slope: I’m linking a brochure here. Recovery is possible, and I promise it’s worth the hard work.